We FINALLY found a place to call home for the next year. It wasn’t as easy as it seemed at first but it’s certainly nice to be settled in. 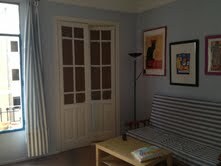 I do think piso hunting has been one of the best ways for me to get a feel for Madrid and its different neighborhoods. We also met some interesting people along the way. Out of the nearly 10 pisos we saw, 3 stand out as truly…..different. There was the older lady who didn’t want to live alone and offered us some rooms in her home, as well as meal preparation at the cost of nearly half our salaries. There was the bus driver with the incense and fountain near her front door who must have sensed our ‘good auras.’ She proceeded to encourage our living with her by assuring us we could all go out until 6 am on the weekends. Then, there was the place we thought was going to be our home for the next year. Seriously. 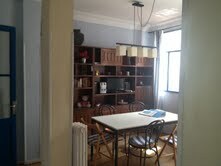 It was in a good part of Madrid, near public transportation and a GREAT price. We moved in. I unpacked all my stuff. Only later did we discover our roommates were smokers. Womp womp. Obviously this is not a big deal for everyone and certainly not a huge deal in Europe. But we were having none of it. Second hand smoke not only exacerbates my heinous allergies, it also freaks me the hell out. Chalk it up to my paying too much attention in health class – I want as little to do with it as possible. We tried to compromise but our roommates insisted on smoking in common areas of the apt rather than just their rooms. Honestly I don’t blame them – they’d been living their longer and who were we to demand new conditions? So, we moved. My preparations for Spain include lots of time spent researching. Lately, I have been obsessively reading about how to dress in Madrid. If I’m going to be there for nearly a year, I’d rather like to fit in and not stand out as a tourist. What I’ve learned from all this research is that I’ve got a lot of work to do. All my research tells me that women in Madrid care about how they look. They dress to impress and class it up on the regular. This is a far cry from my day to day routine. I think of the time in my life during which I cared about my appearance daily as merely a phase, albeit a lengthy one. From 7th-12th grade, I put forth consistent effort. My hair, nails and makeup were done. My outfits had thought behind them and my eyes were stifled by my contact lenses. Until, somewhere along the line, I stopped giving a damn. Do I still try to make myself presentable every now and then? Sure. Are there times when I put forth a little extra thought and effort? Certainly. But on the day-to-day you would be hard pressed to find me well, put together. These past two years of teaching really did a number on me as well. Sneakers became my shoe of choice, and it was enough for my hair to be washed and not styled (or even dried). I’ve been known to throw on a T-shirt for a trip to the grocery store, dentist, mall – hell, wherever I think I can get away with it. I don’t think this will fly in Spain, so my T-shirts will be reserved for in-home lounging. Instead, I’ll be making use of my flowy, button-down blouses which I love anyway. Apparently, wearing shorts in Madrid is a surefire way to announce oneself as a tourist. Some younger Spaniards may wear shorts, but mostly they are reserved for the beach. So, while I’ll bring along a couple pairs in case I ever work up the courage to wear them with stockings, I’ll be leaving most of my shorts behind. Instead, I’m bringing along (and shopping for more) conservative skirts and dresses. I actually read somewhere that the thought of shorts keeping one cooler is more cultural than fact-based, and that skirts/dresses work as well while looking better. If you know me well, you know how much I hate heels. Well, hate wearing them. I am just so much more about comfort when it comes to walking around, and have taken to wearing sneakers regularly. In Madrid, sneakers are for they gym and well, that’s about it. I have exactly ONE pair of heels, and I wear them very rarely. While I don’t plan on jumping into heels on the regular in a foreign land sprinkled with cobblestones, I do plan to change up my footwear. I think I might be able to be ok with a solid pair of flats at first. Then, I’ll invest in a good pair (or 2 or 5) of Spanish shoes while abroad. While I have been content and adamant about how little effort I put into my look on a daily basis, I’m quite looking forward to this big change. Perhaps this stint in Spain is intended to ease this 24-year-old back into the real world as a professional. I used to be quite the girly-girl, and am more excited than I thought I would be at the prospect of putting extra time and effort into my look. If you’re interested in checking out the style in Spain, check out http://www.zara.com/es/. If you have any tips or questions, I invite you to comment!